Craving a splash of sun in chilly November? It doesn’t get sunnier than the sparkling city of Dubai, with the mercury soaring to highs of 31°C. During November, humidity is low, making it a great time to explore the pristine beaches and the sandy desert landscape or sail across Dubai Creek in a traditional dhow boat. Travellers love Dubai due ot its wealth of activities and things do do - discover the world-class Dubai Mall, hop on a hot-air balloon ride, sample striking Arabian cuisine, go on a desetrt safar on camelback or with 4x4 buggies and check out the designer boutiques before hitting the sun-soaked beaches. If you’re looking for winter sun, the Canary Islands are the perfect answer thanks to their toasty year-round temperatures. It’s no wonder that Tenerife's major resorts Playa de las Américas, Costa Adeje, Los Gigantes, Puerto de la Cruz and Los Cristianos are hugely popular for holidays in November. Plus, with the peak travel period having ended, you can also expect great deals on hotels too. Kick back on the sandy Blue Flag beach of La Tejita in El Médano, take a dip in the natural rock pools of Bajamar at the Anaga Mountains or dine at tapas bars in Los Cristianos - delightful. Cyprus is a real jewel in the Mediterannean, with gorgeous beaches sweeping the coastline and a whopping 340 days of sunshine a year - perfect for a winter sun escape. One of our favourite destinations for shoulder season holidays in Cyprus is the beautiful town of Paphos, which has lots of activities and sights to enjoy even if it’s not beach weather. The pine scented Troodos Mountains create the perfect backdrop for a scenic stroll, or aim a little higher and soak up views of the gorgeous landscape from atop Mount Olympus. If you fancy a road trip, travel 45-minutes from Paphos to the pretty village of Odos known for it's delicious local wine. In the evening, head to Theo's Seafood Restaurant in the heart of Paphos, for fantasticly fresh fish dishes (the seabass is a favourite) with striking views to match. Gran Canaria is an ideal beach holiday if you're looking to laze on the beach a little later in the year - the Canary Islands have some of the sunniest weather in Europe during the winter. Discover the massive sand dunes of Maspalomas as they drift out to a sandy seashore, or take a camel safari in true Saharan style, instead. Whether it’s sunbathing or spending time at beachside restaurants and cafes, you can rely on sunny days in Gran Canaria with its lively capital Las Palmas to get you in the holiday spirit. Stroll the sunny beach of Puerto de Mogan and soak up the atmopshere of its lively marina, or head to Puerto de las Nieves on the west coast near the Agaete Valley. If you want an exciting city escape, November is a great time to visit the hustle and bustle of Marrakech, Morocco. Enjoy sweet-smelling souks and cultural sights with temperatures in the mid twenties - November offers perfect weather for pottering around and exploring the city comfortably. Experiencing the night markets is a must alongside a trip to the iconic medina, or if you're craving time by the coast, why not venture to the port city of Essaouira or the gorgeous beach resort of Agadir, just a few hours away. History buffs take note, The Royal Agdal Garden in the south of Marrakech has been around for nearly 900 years and is definitely worth a visit. It’s always sunny in Florida, with temperatures reaching around 27C in November, making it a perfect family vacation or getaway with friends. South Florida boasts stylish stretches including Miami Beach and the Florida Keys, while Fort Myers and Kissimee offer loads to do and see. If you’re holidaying in Florida with family, take the kids to meet Mickey and Minnie for a trip of a lifetime at Walt Disney World in Orlando. 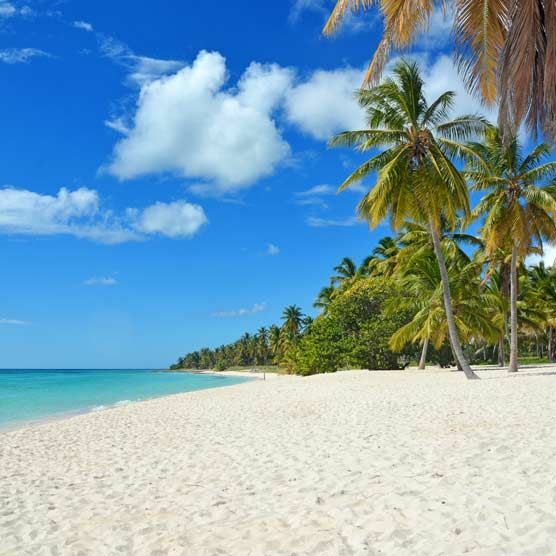 Punta Cana, on the eastern coast of the Dominican Republic has been celebrated as a hotspot for 2017 and 2018 thanks to its beautiful palm-fringed beaches and luxurious seafront hotels. Expect temperatures averaging 26°C and blue skies in November, with highs of 35°C - making it an ideal winter sun holiday destination. If you've got the kids in tow, take them to Manati Park, complete with a zoo, nature park and live dolphin shows. Get your pulse racing and go windsurfing in the spa resort of Cabarete, which has a gorgeous sandy beach besides canyoning activities along the river, where you can discover hidden lagoons or hiking in national parks at Cordillera Central. The volcanic islands of Cape Verde, lies south of the Canary Islands and shares its year-round sunny weather, with November temperatures averaging at a lovely 28C. Laze on pristine white sand beaches or spend the day at sea on a cruise, pausing at unspoilt stretches and coves along the way. The waters are perfect for windsurfing and scuba diving, which will reveal rich marine life. Check out the island of Sal, known for its endless sands and waterfront cafes. Located south of Sal and also worth a visit is Boa Vista, with its lunar landscape, white sands and waters where you can spot whales.